Hmm. I’d love to throw respect back to Booker and Dax. It’s one of the most approachably creative cocktail bars in the world. 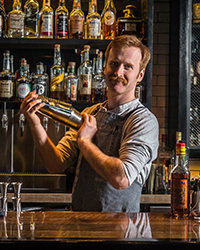 Dave Arnold has a way of taking something like a gin and tonic, or a martini, or your standard daiquiri and completely turns it on its head while not changing the integrity of the cocktail. The Bangkok Daiquiri is better than any muddled daiquiri because he really took the time to think about what happens to the flavor of the basil. He changed the game without slighting anyone. On the flipside would be Dead Rabbit, where, creatively, they’re approachable in every sense of the word. They’ve taken cocktails that have been dead for 100 years and are bringing back flavor profiles that people don’t play around with anymore. They’re considered the best bar in the world for a very good reason. What is one drink that everyone should learn how to make? The Last Word. It’s absolutely delicious. It’s mildly vengeful because of the Chartreuse with a touch of sweetness—a perceived sweetness—from the maraschino. It’s something that is so well-balanced and approachable that anyone with any interest in cocktails can learn how to do and enjoy it. Miller Hi-Life. I love Miller High Life. They’re delicious. On a hot day, all I want to do is have a really cold Miller Hi-Life, sit on the couch and watch TV. They’re simple and crushable. Probably the Gunmetal Blue. I really love the naming of that cocktail. I’m a really avid Tom Waits fan, and when I started developing our first menu, I was listening to a ton of Tom Waits. And there’s a song called “Burma-Shave,” a hauntingly beautiful song. And there’s a line about the color of the gun. And I really wanted to have a blue cocktail on the menu. Bartending trick to impress your friends? I love using my iSi charger for rapid infusions at home. What you can do with that is take a little bit of spirit and charge it twice to infuse it. After five minutes, you have an infusion that would have taken two days. I love doing that for cocktail parties at home.